If we do not teach Sloyd individually, it is not a means of education in its truest sense, since it is not based on the nature of the child; and unless Sloyd be so based, it will soon lose its potent educational character. Teachers have said they have learned far more from an educational point of view through teaching of Sloyd, than through he teaching of any other subject. They have, through individual teaching, enjoyed to watch the gradual development of the individual. Instruction aims at the implanting of knowledge and the promoting of dexterity, while education aims at the development of the faculties. Class teaching in manual work treats of Instruction and not of Education strictly so called. It does not take into account the nature of the child except in a very perfunctory manner. It is not the development of the individual scholar but the individual class that is aimed at. The minds of the scholars composing it are at various stages of intelligence; they differ also in ability. This sentence is revealing. Salomon, understood intelligence as being in stages of development whereas, most educators see intelligence as fixed. A child is either smart in this way or not is the common view and nothing could be further from the truth, as intelligence in its various forms mature as the child develops and as it is applied and experience is gained in its use. 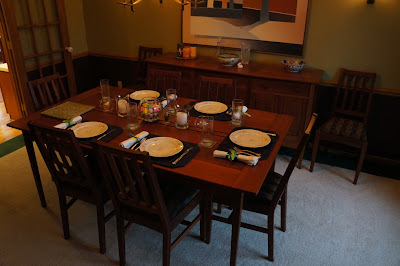 Last night we had dinner with my cousin Mary Lou and her husband Michael in Waukesha, Wisconsin, and I was reunited with dining room furniture I had made for them in 1994 or 1995, and that was featured in 3 articles I wrote for Woodworker's Journal much earlier in my writing career. It was such a pleasure to share a delightful meal in the midst of my earlier work, and to see that it is still as nice as I remembered. 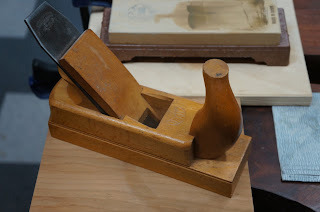 most difficult and most clear..
Who in their right minds might think for a moment that a system of woodworking education could offer anything of theoretical significance to education at large? That a method of woodworking education might offer something of theoretical value to the teaching of political science or some other subject? Now even university professors are "flipping classes" to make lessons less reliant on lecture and more accessible through hands-on, direct experiential learning. It is about time, that educators became more aware of the inefficiencies of class teaching. The idea that a professor can stand at the head of the class and efficiently mind meld his own internalized brain content to others is based on a complete misunderstanding of how the mind works. If Salomon had been taken seriously over 100 years ago, we would have a completely different system of education, and millions of students would not have been required to engage in insufferable learning. And if education were not made so insufferable, more and more students would go on and on in it instead of dropping out, and here we're talking about students in high school, college, and even those seeking more advanced degrees. "... in class-teaching all children are addressed at the same time. A signal is given for all to stop and listen to what the teacher has to say; hence the train of thought of each individual is broken, and attention, instead of being developed, is arrested and destroyed; the child forms a habit of breaking off a train of thought, instead of persisting on its continuance." Anyone who has paid the slightest attention to the workings of his or her own mind will have noticed that when a professor makes reference to a particular word or concept, the mind of the listener can (or must) be turned inward to make necessary connections, and those connections can (in an interested student) inspire questions, which then lead the students to stop listening to all that comes next as each question is formulated. So even he best and most interested students often fail to make full use of what is offered in class-teaching. Then, of course, the content of class itself must be designed to meet the learning needs of the slowest student, not the best and brightest. Can it be any wonder that some students are bored and checking their facebook pages while in class? This difference between class-teaching and individualized instruction was the most difficult thing for educators to grasp. Then as now, they preferred that learning be simply spewed without regard to whether or not students actually received and benefitted as individuals from what they were intended to learn. Salomon recognized that what teachers might learn in educational Sloyd would make them better teachers whatever they attempted to teach. With regard to individualized rather than class instruction, Salomon noted: "The introduction of Sloyd will be an introduction of true educational methods, which teacher may adopt in the teaching of other subjects." Sadly, most did not. In any case, it is a good thing to observe learning in your own hands, and take note of the mind as well. Salomon had observed a few things that educators at large either ignored or allowed to go to waste and our current system of public education suffers for it. Randall sent the following for your reading enjoyment, What being a handyman has taught me about male insecurity. My wife and I are visiting my daughter in Madison, Wisconsin where she is in graduate school. She's down to her last class, her last semester, coming close to the conclusion of her research, and can smell the barn. I can remember my last days of undergraduate school during which I was more than ready to get into the real world*, and into real work** of some kind. One thing that all students seem to know about school is that it is artificial, that in some cases it has only tenuous connection to real life. It is claimed that education is preparation for real life. We know the statistics tell us that those with more education make more money in real life than those who do not. And yet we know when we question the efficiency of formal education that nearly 50% of teachers with masters degrees in education leave the field within 3-5 years. All kinds of students move on to fields other than those in which they invested heavily in time and money to enter. I, for example, graduated with my major in political science to become a woodworker, a field in which my only formal training came in the 7th and 8th grade shop classes. The problem as I see it is the failure to connect the abstract with the concrete. For example, if students hoping to become teachers were to teach first, and learn about education concurrent to their teaching, they would surely know whether or not it was a field in which they hoped to invest a lifetime of learning and continuous study. If those getting degrees in political science were put in situations in which they were actually using what they learned, they might better direct their learning energies to greater effect. So that is where my friends Elliot's and Charlie's new book Leaving to Learn comes in. We learn best when we can connect what we are learning to real things that we are actually doing in real life to benefit family and community. Is that so hard to explain to explain to anyone? Dewey knew it and said it. Saloman and Cygnaeus and Pestalozzi explained it and demonstrated it and devised educational methods to make use of it. There is no better way to learn than by doing real things, and by being of real value to family and community. The great shame of modern education is that we squander our most valuable resource... that of being purposefully engaged in real life. The strategic engagement of the hands in learning can fix all that. The photo at the top of the page is Lake Monona. The very small figures at the center of the ice are a man and two dogs. *world (n.) Old English woruld, worold "human existence, the affairs of life," also "the human race, mankind," a word peculiar to Germanic languages (cf. Old Saxon werold, Old Frisian warld, Dutch wereld, Old Norse verold, Old High German weralt, German Welt), with a literal sense of "age of man," from Proto-Germanic *wer "man" (Old English wer, still in werewolf; see virile) + *ald "age" (see old). **work (n.) Old English weorc, worc "something done, deed, action, proceeding, business, military fortification," from Proto-Germanic *werkan (cf. Old Saxon, Old Frisian, Dutch werk, Old Norse verk, Middle Dutch warc, Old High German werah, German Werk, Gothic gawaurki), from PIE root *werg- "to work" (see urge (v.)). It seems that education's answer to failing education is more education or more admistrative control of education, when instead, we might be asking more questions about how to engage our most obvious educational resources to offer greater learning opportunities to kids. Is that a long convoluted sentence or what? Let's work our way patiently through. Educators think that if kids aren't getting it, then we need to teach our teachers better, require them to get even more advanced degrees, etc., etc, and supervise and control them more thoroughly. In the meantime, the wisdom and the capacity to engage children in learning are already available in our communities, in each and every community, and are being continuously and completely squandered and ignored. Yesterday (thanks again, Keith) I shared a link about a farm school program in Kansas Farming theme saves small Kansas school. The Walton, Kansas Farm School illustrates this important point. Within every community in the US there are educational resources left untouched that have the greatest power to touch kids. In each and every community in America there are activities of real life taking place that have the capacity to more deeply engage children in learning, and there are folks with character and deep commitment to kids who are left at the sidelines of the educational process, who might reasonably be called and assisted to teach. Another example is illustrated by the new book by Elliot Washor and Charles Mojkowski, Leaving to Learn, which shows that when you get kids doing real things in their own communities, learning from highly skilled mentors within their communities, they become more deeply engaged in learning. The interesting thing is that mentors also benefit when their educational value within the community is recognized and engaged. These two simple examples offer the foundation for a revolution in American education. They are not educationally detached, but are instead the fulfillment of the dream held by progressive educators since the time of Comenius. We must stop squandering our most useful educational resources... the child's natural interest in learning, and the community's capacity to teach and share from real life. Thanks, Greg, for the video on .b mindfulness embedded above. Today the Clear Spring School lower elementary continued making toy horses for their imagined journey west. 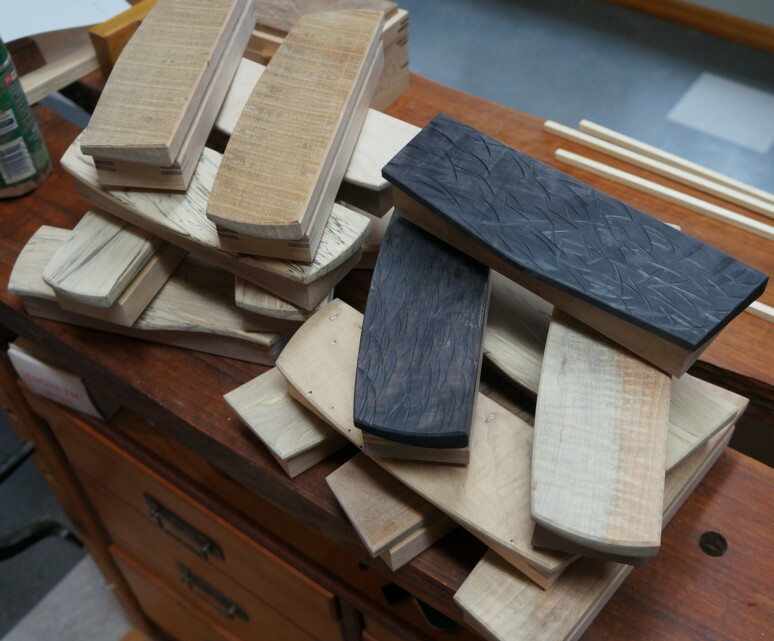 Not much is real about the journey west, but everything about the wood shop is. My students love making real things from wood, even when those things are just to facilitate playful learning of other things. My middle school students turned wood this afternoon, attempting to make French rolling pins. I also got help cleaning the school wood shop to have it ready for a social event and the annual board meeting which will take place onsite. "The math book at this school is a barnyard. And the school’s math proficiency, according to the state of Kansas, is 100 percent. “Math isn’t numbers on a piece of paper,” Principal Natise Vogt said. No, Walton kids lug it in buckets, pat it on the nose and fill it to a mark. Math gets their hands dirty. When the school nearly closed six years ago, officials in the Newton School District changed it to a charter with an agricultural theme. Science, reading, math — all tied to the barn out back, with each class paired with a local farm family." Read it. As Keith noted, it is right in line with what I keep describing in the blog. There is no sure way of engaging the intellect and moral character of the child except through the hands. I've posted a shorter version of the new video reduced for viewing with iPhone. Texture from original milling, natural shrinkage and weather. During the 9-1-1 tragedy the Bush administration, fearing an economic collapse, informed us that our patriotic duty was to continue to consume like there was no tomorrow. Then, when we went to wars in Afghanistan and Iraq, we were assured that we were deserving of the small tax breaks, that we need not make any particular sacrifice because we were now at war. We were once again assured that by partaking of the vast, never ending supply of cheap consumer goods imported from other countries, and purchased with American indebtedness, we were doing our patriotic duty in a time of war. Even at a time in which most Americans wanted to do something more to help and would have sacrificed by paying higher taxes we were assured that we could let the troops fight it out as we were to be greeted as liberators. And now we are celebrating? or at least marking the 10th anniversary of our voluntary, unnecessary war with Iraq. But that was not the start of consumerism as a disease. We know that the disease consumption is highly contagious. Consumerism is too. It feeds upon false pride. It weakens the body's defenses, and the character of its host. Consumers are dehumanized as statistics and numbers of folks, studied and analyzed to gain maximum return on investments in advertising and other attempts to manipulate us to buy products. We are made to feel insecure that our teeth aren't white enough, and stupid when the products they sell don't work. And our schools, by keeping our students under restraint and observation, are instrumental in raising whole new generations of hosts for consumerism the disease. The hands actually touch every facet of human culture and relationship to the planet, and to connect us to each other. Encouragement of consumerism is only one effect of our failure to engage the hands in learning and making. There is a solution. Make certain that the things you buy are tools that enable your own creativity. If you are not ready for that, then at least invest your monetary resources in encouraging the growth and creativity of others. Those in your own community are best. My friends Elliot Washor and Charles Mojkowski have a new book out, Leaving to Learn, which addresses the problem that once every 12 seconds a student drops out of high school. Leaving to Learn is built upon the authors' experiences with Big Picture Schools which integrate on and off campus learning, thus engaging students in real world experiences, known to engage learners. I've been trying for years to get our local public school to offer a learning through internship program to our public school students. Today the high school students at Clear Spring School put strings on their cigar box guitars. In case you missed yesterday's post, this link is to the video made by Murdo and Nancy in which I give offer a glimpse into my work. Murdo is a former film maker who worked on several films with Francis Ford Coppola before moving to Eureka Springs. "I want us all to think about new and creative ways to engage young people in science and engineering, whether it's science festivals, robotics competitions, fairs that encourage young people to create and build and invent -- to be makers of things, not just consumers of things." The maker movement has actually been going on for a time much longer than the Obama presidency, and unfortunately almost nothing seems to be happening in the Department of Education except more testing. Government seems to see the need for making as a purely not-for-profit endeavor unworthy of governmental support. Three friends of mine, Eliot Washor, Charlie Mojkowski and Dale Dougherty, are featured in a new book, Design, Make, Play: Growing the Next Generation of STEM Innovators. It is fantastic to see such emphasis on making in the United States and see our young people being encouraged to make, instead of merely reclining into a consumptive life. Consumption is a disease. Making is the foundation of human culture, and without it, we do not reach our full capacities as human beings. There is one serious limitation to the maker movement that has to do with quality of work. At the core, art and science are one thing. A single breath. A singular expression of humanity. I could talk again about the vector of human achievement. But let's just say this: "You can't successfully whittle a stick without making scientific observations about the characteristics of wood, its density and direction of its grain." Today I got my copy of a video, called Doug Stowe, filmed, produced and edited by friends Murdo and Nancy. It is long, but it offers a brief view into the nature of my own work and I hope expresses some of the importance of working with our hands. The blog shrinks the size of the display. Please double click the video to see it full screen. As you can see I'm ready to apply finish to the bracelet boxes. They offer contrast in a variety of ways. Perhaps most immediately apparent is the shape. The lids have either curved or angled shapes that contrast with the rectilinear bases. Even before the Danish oil finish is applied you'll notice color. The lids contrast with the color of wood used in the base, and two of the lids have been blackened through a chemical process called ebonizing. You may then notice texture. Some lids are smooth. Some have the rough sawn texture of the wood that resulted first from the saw and then from weathering as the wood dried in stacks out of doors. Then you may notice more subtle contrasts in the figure and grain. These natural marks contrast with the smooth crafted surfaces achieved in the rest of the box. Then you'll also notice the "artificial" texture which I created using a sanding tool to make almost random marks on two of the lids. These first impressions are intended to draw the viewer into closer relationship to the work. Pick a box up and you will see other evidence of contrast. 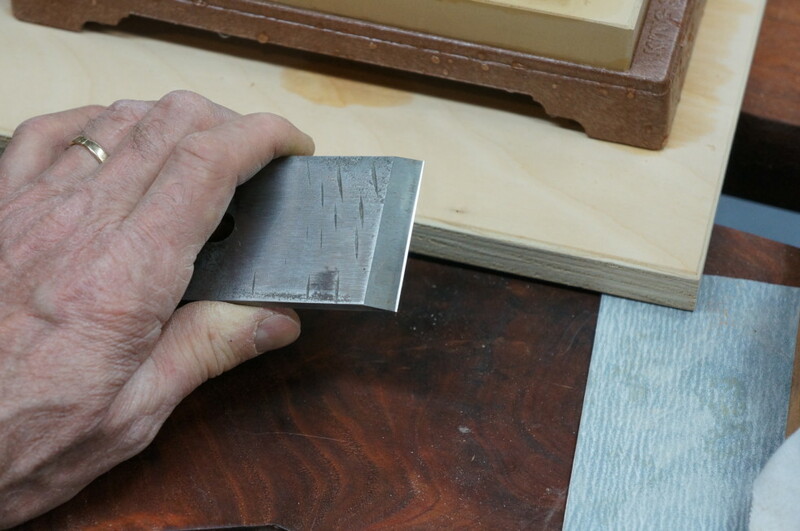 On some, contrasting wood keys are used to give greater strength to the mitered corners of the box. On others, as you open the box you will see contrasting wood splines that secure the mitered joints. These diverse attributes of shape, color and texture are intended to illustrate the rich depth that the use of contrast brings to a craftsman's work. Yesterday I mentioned Bastian's computer game re-creating the Clear Spring High School building and grounds as the backdrop for alien battles. We think of learning as something that is imposed and composed outside the child by teachers and administrations, and yet, learning, the process as it applies to each child is innate. They may not be always engaged in learning what we want them to learn. In fact, we know that these days they learn too soon about too many things we would never want our children to have to consider, ever, as they are the failings of our human culture. The list of human atrocities is long. But even if our world were nearly an ideal place we know that our children, even as old as 25 may not have developed the frontal lobe maturity to have the best judgement as to their own needs and actions. But, learning is what they do, and what they do best. Left to their own devices, children learn, and they learn more deeply and to greatest lasting effect when they are allowed and encouraged to immerse themselves deeply in learning. So how can we establish schools in which children are allowed to follow their most natural inclinations to learn and learn at greatest depth? And yet be given inspiration, guidance and trust? How would we structure schooling to take advantage of our capacities to enter what an athlete might call the "zone" of learning, or that Csikszentmihalyi might call the "flow?" The first step is restructure schooling to allow children to become engaged in doing real things. Art, music, laboratory science, wood shop, stone masonry, and much more. As long as schools only present abstract learning, how can be expect our children to not be bored, disruptive and disengaged? Not surprisingly others and I have written about this before. 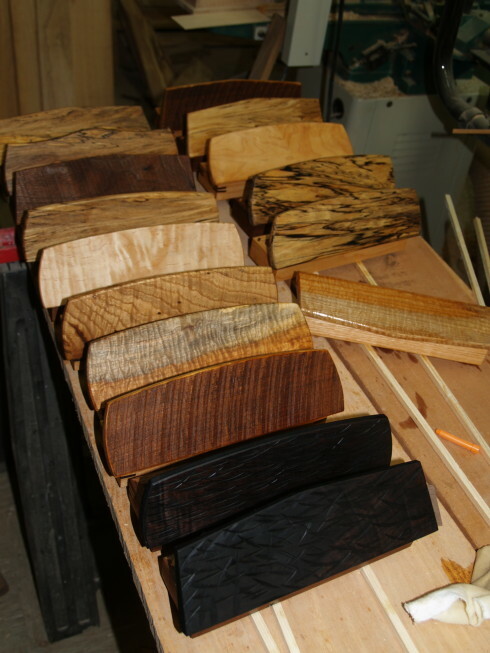 The bracelet boxes now have their first coat of Danish oil applied as you can see at left. Most of us have some experience of being completely engaged in something to the point that time stands still. It and we as sense of separate-self may have disappeared into the woodwork, a state that athletes would refer to as "being in the zone," or that Psychologist Mihaly Csikszentmihalyi called "flow." If you've not experienced it yourself, you may have witnessed it in others. It can happen in athletics, or in the wood shop, in instrumental music, in the kitchen or in the garden. Yes, it can even happen in computer programming. Ask Bill Gates. I am reminded of one of my first high school students when the Clear Spring High School first opened in 2001. Bastian had decided to use gaming software to create a complete digital version of the high school building and grounds as a place for aliens to have war. He took photos to enable him to duplicate all the textures. He measured the grounds to the inch, to perfectly recreate the inside and outside dimensions of the building. The wood shop and tools were included. To see Bastian at work was to witness a relentless lightning blaze of staccato on the keyboard. Now, you're unlikely to find a computer program that still can play what he created, but such a simple illustration can describe how learning can be a total engagement of self. Front and center. And yet we create schools in which students are held at the sidelines and periphery of their own learning. The hands serve as a metaphor for complete engagement. All hands on deck! If man is as Alfredo Bosi says, the symbolic animal (and he surely is), it is the hand that serves as the symbol for the total engagement of man. We know that when we learn hands-on, we learn more deeply and to greatest lasting effect. And so it is by the purposeful, deliberate, strategic engagement of the hands that we get a grip on learning and a firm grasp of educational reform. Not by stilling Bastian's hands on the keyboard, suggesting that he do better, more purposeful things, but rather by unleashing the fury of his engagement... recognizing the passion he has for his work and giving space for it to be done. And so the hands are symbolic of important things, whether on the keyboard in flurious strokes, or kneading dough as one's sense of separate self is lost in the anticipation of sharing bread with others, or as we dig deep to make room in the soil for new growth. The hands and the total engagement of self that the hands prescribe, and symbolize provide the key to educational reform. Engage the hands, and the heart follows. I have been reading about the collapse of Chicago public schools and cannot help but wonder why Duncan was chosen by Obama as the secretary of education. More and more standardized testing for all our nation's schools are not what the hands prescribe. The current issue of Columbia College Today celebrates the 75th Anniversary of their Literary and Humanities program which is part of the core curriculum at Columbia University. It is a great program in which every student at Columbia University (except engineering majors, general studies students, and candidates for advanced degrees) of the same year are reading the same books (mainly classic literature). Lit Hum offers a unified sense of literary culture to the students, raising the same questions that have concerned human beings throughout history and is certainly one of those programs that makes a great university great. I have an idea that can make a great university even better. Some of my long term blog readers will remember 6 years back when my daughter was first enrolled at Columbia College. I began a conversation with Alan Brinkley, provost, concerning my naive proposal to add a hands-on component to the core curriculum. Oh, well. Here we are 6 years later, and the core curriculum on the Titanic remains the same. I would never suggest that the core curriculum be abandoned. But I will continue to suggest that if the purpose of the core curriculum is to bring us to a common point of human culture, to leave the development of skilled hands out of the formula, is to sustain one of the worst shortcomings of American education. Early proponents of manual arts understood that to teach all to create useful and beautiful objects was an important component in democracy, as it helped to sustain the shared sense of the dignity of human labor. What would happen if students of one of the world's great universities were to enter their intellectual engagements reinforced and illuminated through the shared framework of humanity that only the hands can provide? Here is how it would work. As part of a core curriculum, students would be arranged in groups according to the classical elements, earth, air, fire and water. There are conveniently, 4 elements and four years of college. And each of these four elements would be addressed through skilled crafts. 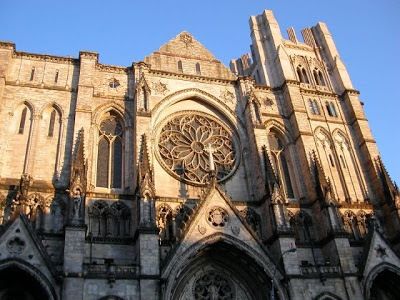 For instance, across the street from Columbia is St. John the Divine Cathedral that has sat idle for years due to lack of funding and lack of trained stone masons. Can you imagine students of earth becoming engaged in skilled crafting of stone? This would be a core curriculum that would affect each student at the core of self-understanding and relationship to human culture . Above is a photo of St. John the Divine, or as some in New York call it, "St. John the Unfinished". It is on Amsterdam, one block southeast of Columbia and serves as an apt symbol of humanity when the hands are forgotten or ignored. One tower is missing and the other just a stub. Worked stopped decades ago. Who in these days understands the value of craftsmanship and what it means to develop skill? In the meantime, if those engaged in politics and academia were to understand the way crafting shapes the lives of makers in finer form and in reflection of higher purpose and truth, they might glimpse their own potential to transform our society to be just, humane and enlightened. Today in my wood shop, I made lids for bracelet boxes and got most of them partially sanded and assembled. The lids are a variety of shapes, and woods. 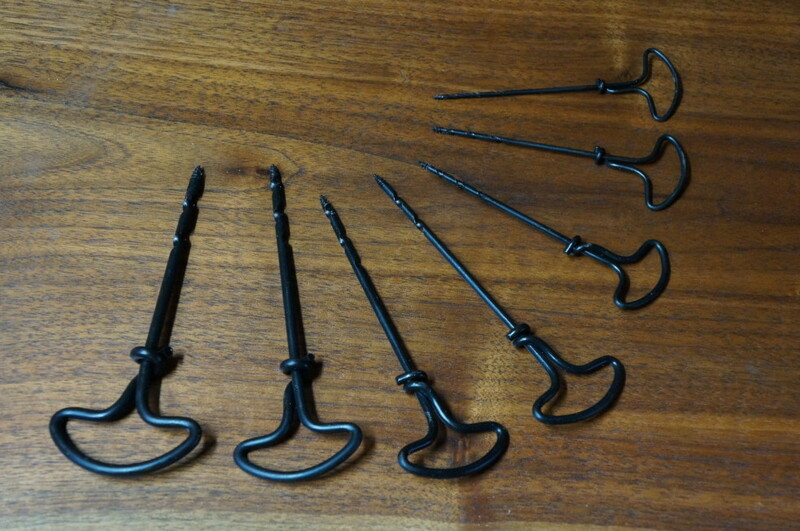 Some have natural textures and others have been textured and ebonized. Aren't these lovely new tools? They're gimlets without the Vodka from Lee Valley and are used to get screw holes started in tight places. You may wonder how the drink got its name? One definition refers to a piercing or penetrating quality. Could that be it? 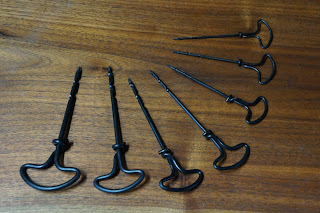 The smallest ones should be perfect for attaching lid supports on the insides of boxes. I've been behind in my reading and finally got around to the Dec/Jan issue of American Craft Magazine. It's called the "Design Issue," as it features eight artists who've made the move from one-of-a-kind to production work. Some sell their designs to manufacturers and others manage teams of employees making what they design. In any case, the move from maker to designer is the aspiration of some. In my mind, moving from small production runs of objects to being merely the designer of those objects mass-produced seems a bit out of touch, and the idea of having minions produce my work in quantities beyond my own capacity and wildest dreams seems elitist, somewhat predatory, the white flag of surrender to values of the consumer culture and a strong move away from the values inherent in craftsmanship. And yet, when you read the stories of these folks, ranging from Thomas Moser who makes furniture with 134 employees to Annie Costello Brown who has a small team of women at work in her home studio, you get the sense that most craft designers are inspired by the tools and materials they actually use, and have hopes of engaging others in the making of fine work. Brown notes, "I wouldn't enjoy what I do without the making part of the process, the discovery that happens when working with materials in your own hands." 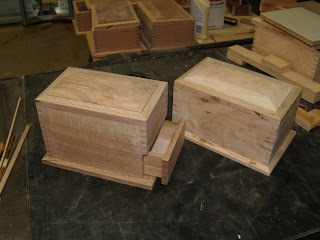 Today in my wood shop, I am making bracelet boxes with the intention of illustrating contrast. 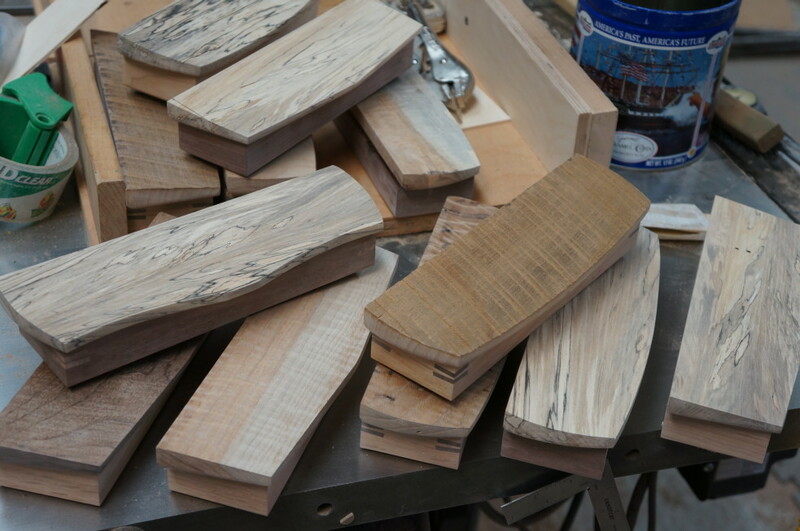 The lids will be made with either matching or contrasting woods and in a variety of shapes. Some are made with contrasting keys visible on the outside. Others are made with hidden splines visible only when the lids are open. 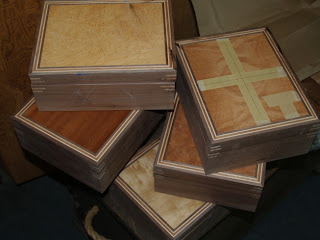 A small selection of these boxes will be used in the book on designing boxes. My own view of design is that we can all become better designers and makers of things in our own homes and home communities, and less dependent on the big leagues and the big box stores. If we were to become communities of craftsmen and craft artists, many of the self-destructive obsessions that plague American culture would fall by the wayside. I am enjoying having an apprentice. Unlike having minions doing my work for me, I have someone here on a fixed term learning from the experience. The goal is not to get my work done, but for him to be prepared and able to do his own. 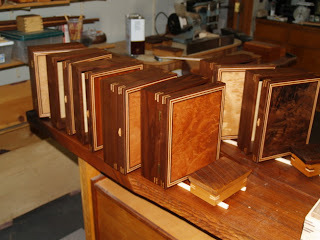 As you can see in the photo above, the first bracelet boxes are nearing completion, with 12 more to go. 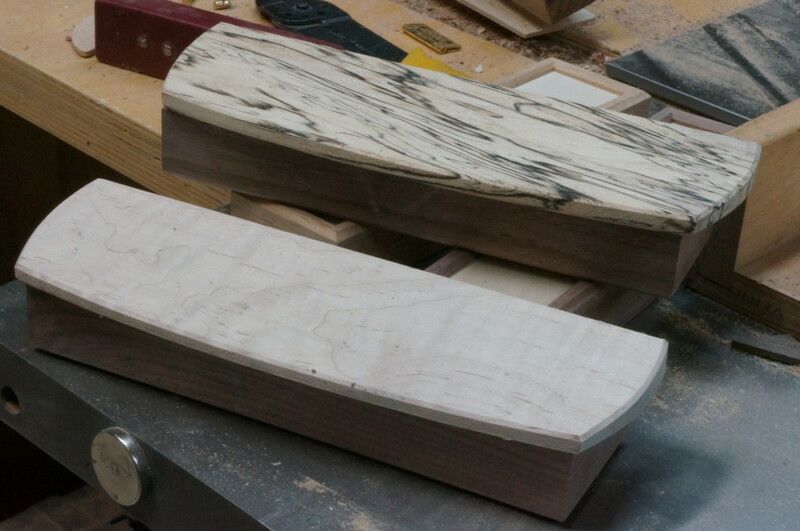 The lids are fiddleback maple and spalted sycamore. I love what happens when curves and angles get together in a piece. The angled lid thickens at the edge to the left and right, making the eye assume more complex curves are at hand. This is the kind of visual effect a craftsman discovers by play. Veneered tea boxes with their first coat of Danish oil. We associate the word artificial with fake and fakery. But its roots merely refer to things that are man-made in contrast to those things that come from the natural world. Museums once had cabinets of things designated as natural, containing materials from the natural world and others designated "artificial" referring to museum quality objects that were made by man and that exhibited human artistry and skill. Still despite the artistry that the word implies, the word artificial carries the burden of association with things that are fake and thus unworthy of real attention. 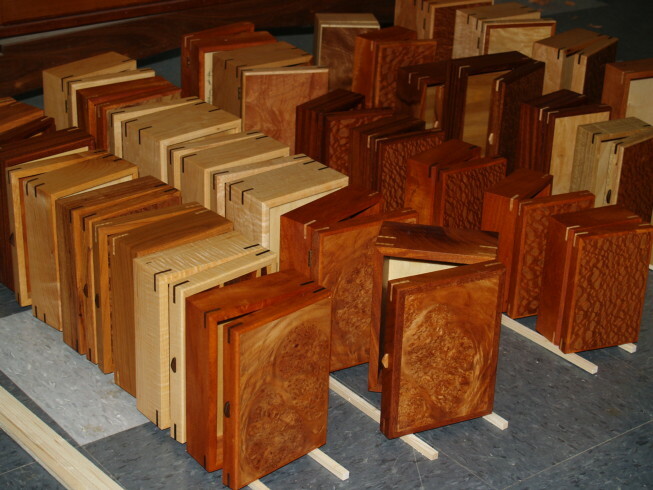 This morning I went to school to begin a thorough clean up while the kids are off for spring break, and this afternoon I am working on chapter 6 boxes, and applying Danish oil to others. Fortunately there is nothing fake about wood working. It demands real things of you. Miss the line as you saw, and there is no command-Z to set things back. Cherry box with rough sawn maple lid. 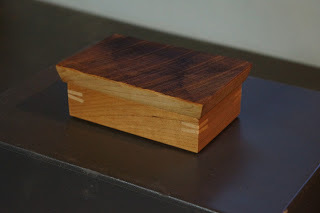 Cherry box with rough sawn walnut lid. Working in the real world commands that we take things seriously. And it is thus a simple way of getting our kids to do the same. Rough wood lids provide contrasting texture. As I was working on boxes to illustrate proportion, I made the sidewalls of trays too thick, so I made thinner ones and turned the first trays into boxes. These you can see in the photo above. 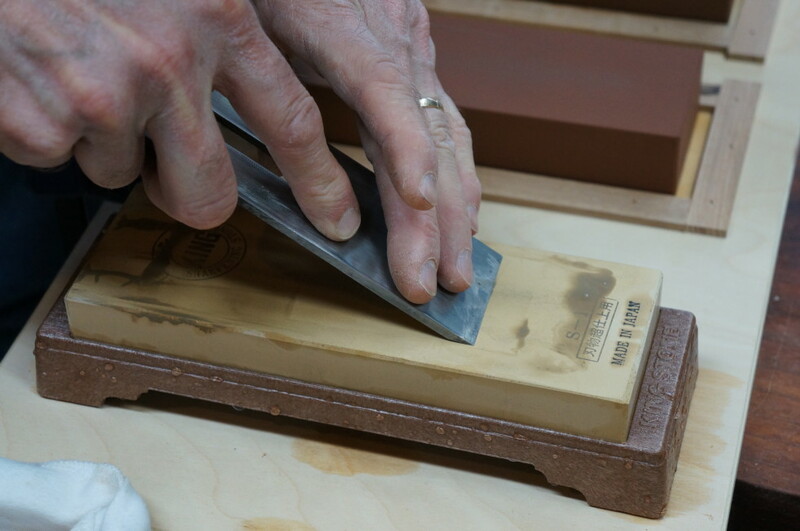 The lids are made with rough sawn wood, still marked by the large blade that ripped it into lumber years ago. I used a wire brush to remove loose material and fuzz. Then I sanded it lightly with 320 grit sand paper, just to make it comfortable to the touch. As usual, these small boxes will be pretty (or at least interesting and useful) when they are sanded and the Danish oil is applied. I've been making many more boxes than normal. Last September, Crystal Bridges Museum asked me if I would make 300 boxes to serve as thank you gifts for their first year staff. Those had to be completed for distribution at the first anniversary party in November. When the museum founder heard about the boxes, she asked that I make another 500 boxes to give to their first year volunteers. Those I delivered in mid December. Now that the museum has had plenty of time to put 800 boxes into the hands of first year staff and volunteers, I no longer have to keep this box making extravaganza a secret. 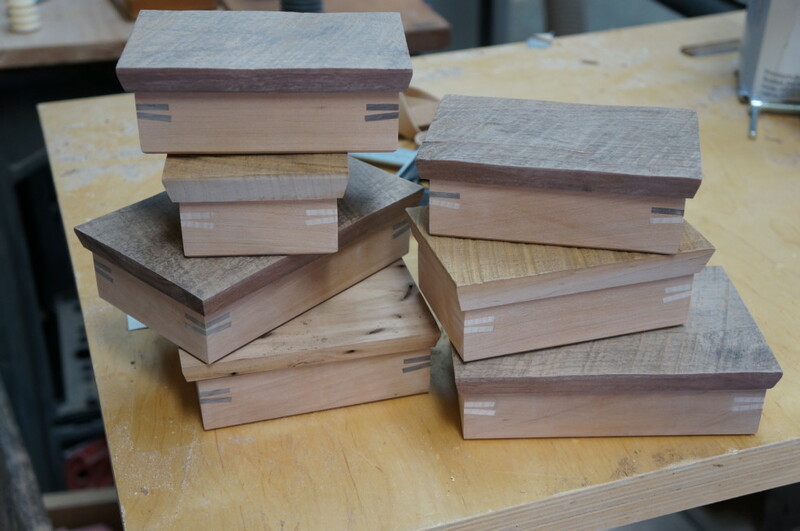 The boxes were made with woods harvested on the museum site during the first phase of construction, so each box has a special connection with the museum grounds. I served as a volunteer consultant when the woods were first first processed from logs to lumber, so it was a particularly meaningful thing for me to have the opportunity to make boxes from those woods. 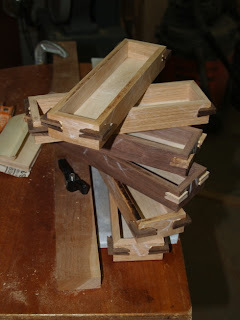 Two bracelet boxes glued at the same time. In any case, I am now having some difficulty not making boxes in larger than normal numbers and my wife is wondering what we'll do with all of them. I also started the 4th project for my new book, this one illustrating contrast through making a small series of bracelet boxes. Each will be different. The primary box in the chapter is walnut and the corners are secured by hidden splines that will be visible only when the hinged lid is opened. 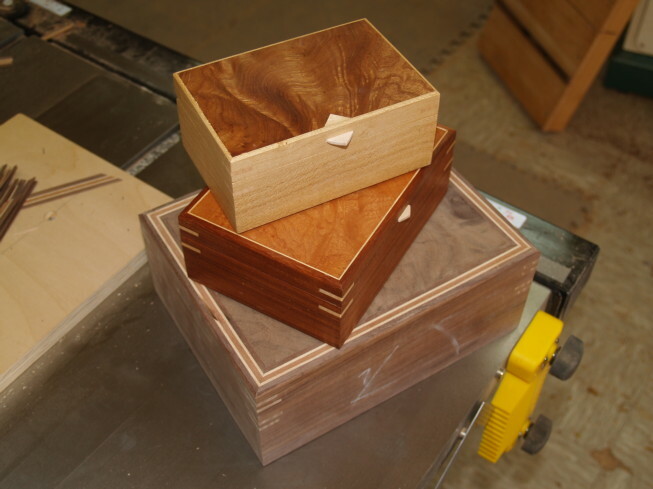 These new boxes are made to be glued up two at a time. I learned that my Master Class making wooden hinges for Fine Woodworking is scheduled for issue number 234, which should come out in July. This is spring break for the Clear Spring School, so I am getting just a bit of extra time in my own wood shop. It seems that about once every 40 years, the pendulum swings, and just as I and a few others of my generation arrived in Arkansas in the 1970's looking for voluntary simplicity, a way of life more in tune with the rhythms of nature, and a course of life more responsible to the planet than that offered by the consumer culture, there are young folks afoot (or should I say "at hand") again in Eureka. And they look for what we sought. Yesterday, Madeline and Andrew Schwerin from Sycamore Bend Farm made a presentation at the UU church on the current movement that seeks roots in the land, depth in family life, and responsible husbandry of community. I tip my hat to those who pick up the shovels where my own generation dropped them. Has the pendulum swung back toward the land? And away from rampant obsessive consumerism? I hope we are entering a spiral moving upward with shared expertise. Great things seem to start small. Andrew and Madeline raise vegetables for the local market and live in a yurt with their under 1 year old child, reminding many of us of our own early days in Eureka Springs. It is my sincere hope that those who work through their own hand-skilled labors find every success. What they are learning is essential to human culture and human survival. "celebrates the beauty and positive benefits of handcraft and how making things with our hands can connect us to heritage. It features articles by folk artists Kate Martinson, Harley Refsal, and Ingebjørg Monsen." 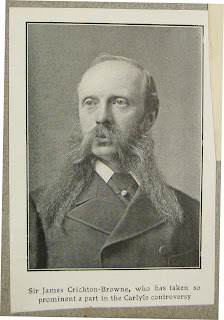 Vesterheim Magazine is a twice annual publication of the Vesterheim Museum in Decorah, Iowa. Vesterheim is a museum dedicated to Norwegian culture. And since I'm half Norwegian, I think I need to make a trip there myself. Vesterheim is a national treasure that explores the diversity of American immigration through the lens of Norwegian-American experience, showcases the best in historic and contemporary Norwegian folk and fine arts, and preserves living traditions through classes in Norwegian culture and folk art, including rosemaling (decorative painting), woodcarving and woodworking, knifemaking, and textile arts. Vesterheim houses over 24,000 artifacts, which include large samplings from the fine, decorative, and folk arts, and the tools and machinery of early agriculture, lumbering, and other immigrant industries. The lives of the people who settled this nation were often as colorful as their folk art and their stories speak through the objects they left behind. If you've been reading here for long, or have paid the slightest attention to your own hands, you will know that the hands and their conscious activities are the foundation of human culture. When society chose to undermine the position of the hands and their labors, adopted a consumer culture in which the maker was of no consequence, we began the degradation of human and planetary life. The video embedded above is of HIPPY USA, an organization headquartered in my home state of Arkansas. Mothers (and fathers) by all rights should be their children's first teachers. Pestalozzi and Froebel made that point clearly in the 19th century, and Pestalozzi made use of how a loving mother would teach as his model for how all children should be taught in How Gertrude Teaches Her Children. Mothers taking such a strong interest in their children and schooling are important to each child's later success in school. They've also found that mothers benefit in self-esteem when they realize their sacred mission in the education of their kids. We also need a HIPPY Woodworking Program for fathers and mothers to take greater interest in their children's and grand children's creative capacities. That, too, will help children succeed in school. In my wood shop today I've been making lids for a few boxes and trying to catch up on my production boxes necessary for spring gallery sales. And while many politicians talk of international test score comparisons, they rarely talk about what high-performing countries like Finland, Singapore, and Canada actually do: They ensure that all children have housing, health care, and food security. They fund their schools equitably. They invest in the highest-quality preparation, mentoring and professional development for teachers and school leaders, completely at government expense. They organize their curriculum around problem-solving and critical thinking skills. And they test students rarely (in Finland, not at all) – and almost never with multiple-choice tests. So, in that we might discover a bit of what the role of a good teacher might be... Not that of restraining kids at desks in adult driven tasks but rather, that of playing with kids, and directing their play. Where teachers are put in situations where they must restrain children in seats and at desks and make them learn that in which they have no self-interest, the school environment becomes oppressive for both teachers and kids. I say this with the understanding that learning is not a thing foreign to kids, but is instead, can become an overwhelming irrepressible inclination. Left to their own devices, all kids love learning. Put in oppressive school environments many children do not like being taught. And both students and teachers pay for that on the bottom line. Put kids in wood shops, put tools in their hands and direct them in their use to make objects of useful beauty, and you will see kids loving to learn, and coincidentally, you will find teachers loving to teach. The opportunity cost of our current system of education is that as we put increasing amounts of pressure on reading, writing and arithmetic, the vast range of human intelligence is narrowed, and children feel far less competent in dealing with the real world. Those who simply mature at a slower pace, are given the impression that they are impaired in various ways, and are led to believe they will always be so. Some children may begin walking at 7 months and some as late as 13 and pediatricians warn that parents should not take such signs as predictive of ultimate intellectual, physical or emotional potential. Despite knowing that the range of various markers of child development widen rather than narrow in time as children grow and mature, children in schools are put in classes where they go through drills arranged for the convenience of the teachers and administration, often with too little regard for the learning needs of each individual child. Otto Salomon distinguished between class teaching and individualized instruction, and that evidently was a point of contention between the followers of Sloyd vs. those of the Russian system which insisted upon classroom instruction as a matter of efficiency. And yet, if you can once get it in your head that we are not all the same, that the timing of our development has very little to do with our ultimate capacities, you can see that as we go through classroom instruction we are led to miscalculate our own strengths, weaknesses and potentials. Those miscalculations may be great as a sorting mechanism, sending some students to academia and some to the trades, but they are a vast distortion of overall human potential, which is often squandered in our current system of public education. For children in standard schools, it is very important to learn to read on schedule, by the timetable dictated by the school. If you fall behind you will be unable to keep up with the rest of the curriculum and may be labeled as a "failure," or as someone who should repeat a grade, or as a person with some sort of mental handicap. In standard schools learning to read is the key to all of the rest of learning. First you "learn to read" and then you "read to learn." Without knowing how to read you can't learn much of the rest of the curriculum, because so much of it is presented through the written word. There is even evidence that failure to learn to read on schedule predicts subsequent naughtiness in standard schools. In contrast, the experience of those in the unschooling movement suggests that left to their own devices, children just simply read when they are ready for it. After all, the opportunities to read are ever present, and the inclination to learn everything children are able to learn from the natural environment is innate. And so, put into a more rational mind, schools, liberated from their sorting process, allowed once more to treat each child as the unique individual he or she is, could return to other more interesting things. On another note, Abigail, director at Elliot School in Jamaica Plaines, MA sent this link to ann article about the upcoming Folk School movement. If you are not in any way a maker, then you are missing out on a very special quality of our humanity. In the past I've written that children are not clockwork, that to lash them to the hands of a clock in their development of skills is to overlook the variations in how they learn and grow. For instance, we know that whether a child walks at 7 months or 13 is an acceptable developmental variation that has no long term impact on the future developmental potential of the child. And as children grow and age, the spread between them grows in various ways, the development of various capacities are not on a rigid timeline and anyone caring deeply about children would not lash them the hands of the clock when it comes to such things as readiness to read. But lash them we do. "The nascent period of the hand centres has not been accurately measured ... but its most active epoch being from the fourth to the fifteenth year, after which these centres in the large majority of persons become somewhat fixed and stubborn. Hence it can be understood that boys and girls whose hands have been altogether untrained up to the fifteenth year are practically incapable of high manual efficiency ever afterwards. "The small muscles of the eye, ear, larynx, tongue, and hand have much higher and more extensive intellectual relations than the large muscles of the trunk and limbs. If you would attain to the full intellectual stature of which you are capable, do not, I would say, neglect the physical education of the hand." "It is plain that the highest functional activity of these motor centres is a thing to be aimed at with a view to general mental power as well as with a view to muscular expertness; and as the hand centres hold a prominent place among the motor centres, and are in relation with an organ which in prehension, in touch, and in a thousand different combinations of movement, adds enormously to our intellectual resources, thoughts, and sentiments, it is plain that the highest possible functional activity of these hand centres is of paramount importance not less to mental grasp than to industrial success." At some point in the current round of study of the human brain, they will begin to connect growth of various capacities in the brain with developmental activity through the muscularity of making while the making's good. We know that our capacity for learning with greatest ease is while we are young. Today in the wood shop, I put hinges on boxes and and my apprentice applied Danish oil as you can see at left. Making a pair of horses. It is difficult for common folk to understand science anymore unless they also understand statistics, and that straightjacket is doing harm to our confidence for understanding everything else. Statistics make things seem distant, removed and abstract. They lead us to undervalue our own direct expertise and make us dependent on others to explain things to us that we should have had confidence to understand on our own. At one time science had to do with direct observation of concrete reality, but these days, direct observation is no longer accepted as the foundation for expertise. Things must now be explained through layers of mathematical abstraction that stand between the observer and the subject of exploration or interest. And so for so many, science and direct engagement in science is held beyond reach and beyond interest. Statistics and standardized testing are a useful tools but should not displace common sense and direct observation. Again, this has to do with a healthy relationship between the concrete and abstract. Joe Miller in a comment on yesterday's post describes inviting his son into his workshop, and his son's curiosity regarding Joe's actual use of fractions. Joe points out that the Sloyd principle of moving from the concrete to the abstract was at play as he was actually using fractions and his son doing homework involving fractions could understand that what he was learning was actually preparing him for something real. Fractions are not abstract when they are carefully explained and applied to doing real things. What a valuable lesson that can be! Nearly everything children are to learn in school could be learned more easily if there were direct applications for it. On a related matter, children's brains and the various functions in their brains mature at different rates and in different order from one child to the next, and yet we put them in schools and run them through drills that either bore them or leave them scratching their heads. This article Research in Brain Function and Learning explains that when it comes to brain development children are all over the place, not all the same, and those schools and teachers who ignore the variations in child development are just plain dumb. Again, this involves the statistical straightjacket, as educators focus on the statistical norm and neglect the needs of each individual child. Today in the Clear Spring School wood shop, first, second and third grade students (our lower elementary) began making toy wooden horses to pull toy wooden wagons that they'll make next for a pretend journey along the Oregon trail. They will write stories about their families and will load their wagons with scale size bags of flour, sugar, and other foodstuffs cut from wood.The project is intended to make use of the children's own active story telling and imagination to make what they learn more relevant and more deeply connected through experience. And as I stated in yesterday's post, action clarifies thought. This afternoon, the middle school students began making sloyd knives and turning French style rolling pins on the lathe. It is challenging make the slightly curved form perfectly symmetrical. It takes concentration. It takes practice. It takes a clear sense of what the tool can do. It requires an understanding of the materials, but most surprisingly it requires a sense of one's own body at work. One would think making a smooth form would be so easy. It's not. I've been asked by an agent to supply one more thing for a proposal that will enable them to begin pitching my hands-on learning book to publishers... a portion of a chapter from the second part of the book that will enable them to see and understand my writing style and help them to evaluate my ability to actually produce a quality book. The first thing to note is that I do quite well writing in short spurts where my passions are aroused, and I am allowed to repeat some of the same points, looking at them from various angles That makes me a pretty good blog writer, and I assume that blog readers come here to get refreshed in their own relationship with their hands. Writing a book can tend to be a long slog in the mud. And that may very well be why educational materials tend to be a bore. And yet, if a book could shift the educational dialog toward thinking about the hands and the role the hands play in leanring, and the vast potential for change that exists in our relationship with them, we could have a very special movement on our hands. That movement would clarify and reinforce the arts in school, would bring a renewed interest in science (as it is best learned hands-on), would increase children's interest in being in school, make school more fun and creative for teachers, scare the crap out of current administrators, and create a new interest in school wood shops. And so this morning, that is my subject here in the blog. Action clarifies thought. In woodworking, cutting a few joints can help one understand how parts can fit together, and once done, thought is complete. In writing, getting a few things down as words on paper or computer screen can bring clarity to thought. And just as in cutting a few joints, at some point, a man or woman must plunge write in. So today, I'll balance my time between office and wood shop. 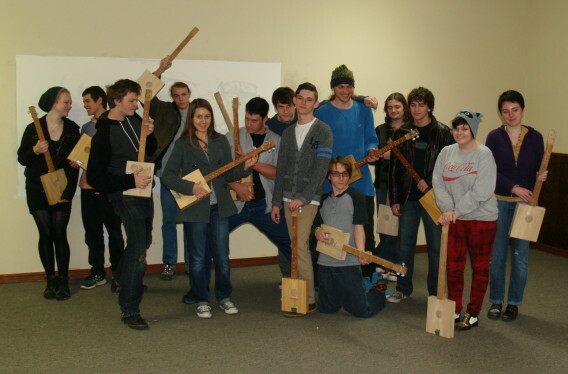 The Clear Spring High School students are amazed that they are actually going to have finished guitars. Some took their guitars home today, strung and ready to practice and begin learning to play. They've promised to bring them back for music. 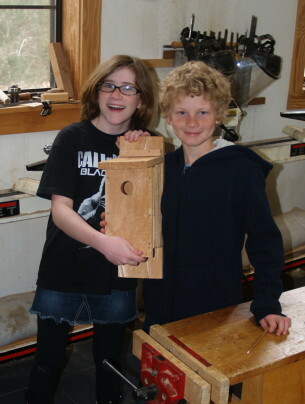 Today the upper elementary students at CSS finished their bluebird houses and spent just a bit of time practicing with tools. In my own wood shop, I am taking a few replacement photos as I finish work on chapter 3. Jonas informed me that my Swedish plane was made in Denmark with Swedish steel as was common with JPBO planes. As you can see in the photo, it took very little time to tune it to get thin shavings from a bit of cherry. 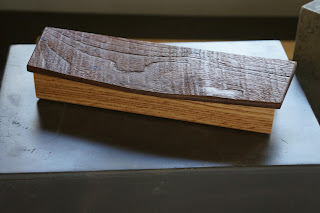 It is a smoothing plane, so is not intended to remove much material at a time. The mouth loads up with wood chips if you try to use it on wood that has not already been planed, and it works best when longer shavings can arise through the mouth. The surface it leaves needs no sanding. 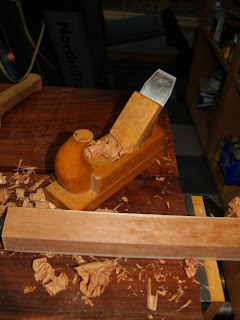 Adjusting the plane to get just the right thickness of shaving requires a bit of trial and error, as described here: Adjusting Wooden Planes. If the plane is hard to push, you are working yourself and the plane too hard, as a series of light strokes quickly done will surpass heavier work in less time, and give better results. If it is hard to push, raise the blade by striking the metal post at the back of the plane body and tap the wedge to lock the iron in place. If the plane is not working hard enough, then tap the top of the iron very slightly with a wood or brass mallet to take a deeper cut. As with all hand-tool operations, less said and the more done is best. You will learn more by doing than what I can tell, and if I play teacher for a moment, I'll remind you that the best teacher would be 1-2% instructor and 98-99% encouragement and role model. 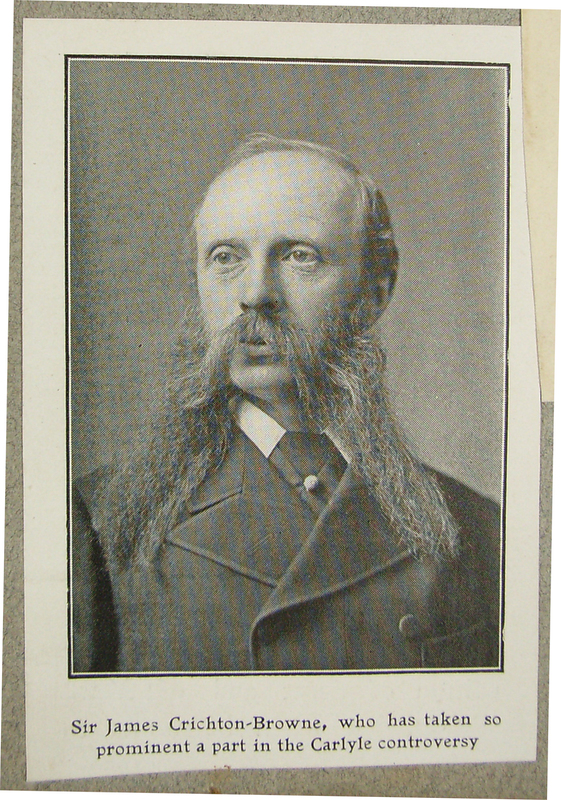 The illustration by R.J. Drillis may be useful in helping to establish the most effective tempo. 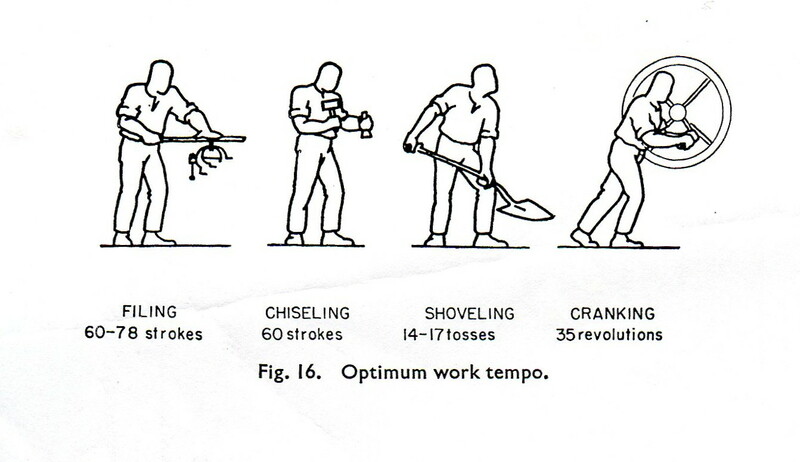 The longer the piece being planed, the slower the tempo, as it takes longer for each stroke. 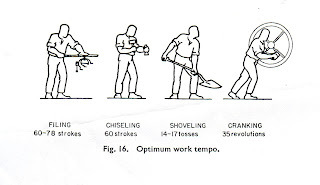 That said, you will want your planing on short stock to be more like filing and less like shoveling, so that it will be less tiring and more fun. 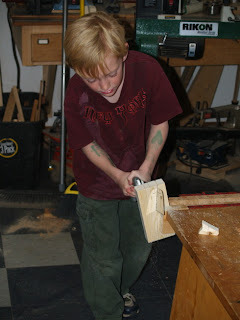 Last Wednesday, one of my third grade students noticed how easy sawing wood has become for her. It is important that children get a sense that things get easier over time and just because something was difficult at one time, it will not always be that way. Unfortunately, much of education does not impart to each child their own sense of unlimited potential. Reading is very much a matter in the same book. Some children do not read as easily as others, and yet schools treat kids as stupid if they are not reading at grade level. Just as in sawing, as muscles grow in strength, and the control in the hand becomes easier, in reading the brain matures, the eyes learn to better track letters on the page and children learn to connect what they've read with their own experience. Putting huge pressure on kids is like trying to plane with the iron too deep. You'll come to the conclusion that there is something wrong with the tool or the operator, when the sole problem was failing to have it set at the right depth. The back of the plane iron must be flat. Polish the edge to mirror gloss. Hone microbevel on the cutting edge. The micobevel should be even across the cutting edge. In about 1960, my father was manager of a large hardware store in Omaha, Nebraska, and special ordered Swedish Danish planes for my uncle Ron. Many years later, my uncle Ron presented one of them to me. And so, I fiddled with it, sharpened it, but never got much time invested in its use. Having many other things to do, I put it aside. Yesterday, I got it out to show my apprentice, and I became more curious about it. I used my set of Japanese water stones to get it ready for use. So this afternoon, I had a cross-cultural recreational experience, using objects from three continents. First I polished the back side. Despite what you may see on the Fine Woodworking website, the object isn't to turn the backside into a mirror in which you can see your face. 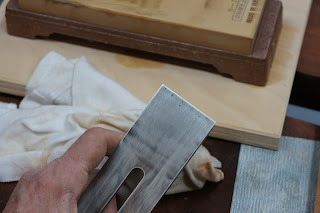 But in order to get a good edge, both the front and back must be polished, at the very least at the cutting edge. In the series of steps shown in the photos the object is that both the back and secondary bevels shine. The drawing of a similar plane below is from The Teacher's Hand-Book of Educational Slöjd by Otto Salomon. 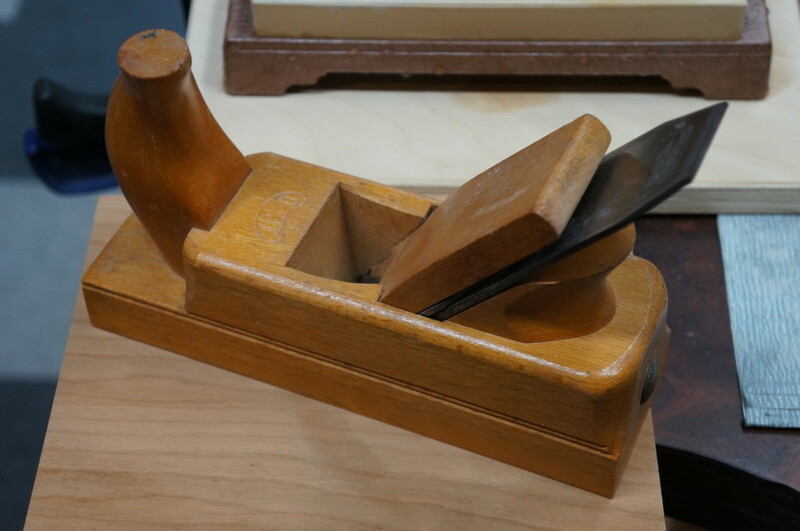 The brand on mine is IPBO, stamped on top, and the plane iron was made by E. A. Bergs Fabriks AB in Eskilstuna, Sweden. Tomorrow, I'll put it to use. Iron in and ready for use. One thing about a 3 string box guitar is that it can be tuned in a variety of ways, and now that our Clear Spring School box guitars are nearing completion, it's time to begin researching ways to play the danged things. 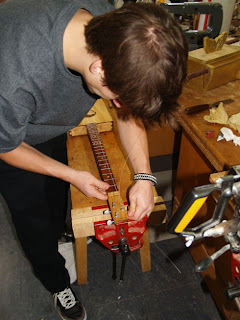 It seems that making a box guitar is almost a thing anyone could do, as there's far less investment of time and materials than in the making of a standard guitar. When it comes to strings, there are only half as many of them to master, and still the pleasure that can be found in making music on an instrument you made yourself, and to feel one's hands revitalized in the process of maintaining character and intellect, is literally a no-brainer. On of the best ways to keep our minds and hands fresh as we age is to keep doing new things. Making a box guitar and then making your first feeble efforts to play it, qualify as new, both in and out of the wood shop. This video is one of many made by Keni Lee Burgess, demonstrating 3 songs on the a box guitar, with the first in Gdg, a standard box guitar tuning that's the starting point in my own play. Watch through to the end to see the chords and finger movements. Now that I've made one, am learning to play it, and can see small ways that it can be improved, there is a temptation to make another. I hope that some of my students also suffer from that same temptation. "Making anything for yourself is a political act... The further we get from the creation of an object, the less we have a connection with the people, resources, and process. This limits how we assign value to objects. If we can all start to make more and consume less, then we can be more thoughtful about the resources used to create the objects and food and garments that we fill our lives with." 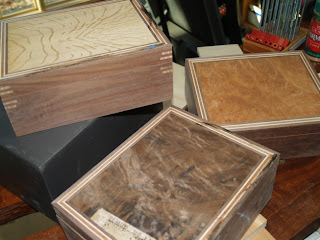 My apprentice came in this morning to do some sanding for me, and to begin applying Danish oil to boxes if the weather is warm enough to work outdoors.Yesterday was as beautiful a day as could be imagined and today's weather offers more of the same. He borught some of his latest work for show and tell. 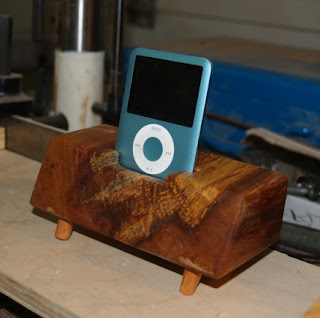 The photo shows an iPod holder which he made for himself. It works great and has the look (due to the legs) of an old time radio cabinet. There is an amazing satisfaction available in making things of one's own design. I have a new distraction in my life, a fringe benefit of being in the midst of helping my high school students make box guitars. I've been staying one step ahead, and at this point, mine is done but for learning to play. It is soothing to run my hands down the neck and to hear precise tones arise from my fingers on the frets. But to train old fingers to do new tricks is not easy. I am of the belief that all children should have the opportunity to explore instrumental music of some kind, and what better kind could there be than an instrument of your own making. As a craftsman, there are some things I would change about this project. I wish the kids would pay more attention to what they could see if they were to look closely at their workmanship. There are glue drips that they think are OK. If they had better judgment in their use or glue in the first place, perhaps the bodies of their guitars would not be such a mess. But on the plus side of things, they'll find greater success than I in learning to play. Kids have a greater tolerance for things sounding like crap, and when one begins playing any instrument, the first sounds you hear will not be Segovia. Those who have refined senses are often deterred in nearly anything they might take up because it is difficult at first to make things do what you want. And kids are really drawn (despite the evidence provided by schools) to do difficult and challenging things. To spend hours getting a series of chords just right, is right up their alley. The same applies to woodworking. I have been telling my apprentice that mistakes are inevitable. There is little sense in doing that which is too easy for you. Mistakes are no cause for shame or embarrassment or anger. We learn to do from what we do. And without evidence of failure, we will not find success. And yet many are deterred from what they would want to do by the apparent failure of their beginning efforts. And so, the role of the teacher is that of a coach. The job is best when it is 1 or 2 percent teaching and 98-99 percent encouraging and helping students to put their own efforts in better perspective. That's why, when I teach adults, I get the best feedback on the mistakes that I've made in the delivery of lessons. When I demonstrate screwing up, they are given permission to do the same, and take greater exploratory risks knowing that they too, can do so without shame. Boxes made of pin oak and maple. We live in a time in which all our lives seem scripted by technology. The email messages come in and some must be answered. It is convenient in one sense. It is easier to respond to associates and friends via email than by hand written letter. It is amazing how quickly we've taken these technologies as a matter of course. We've grown dependent upon them. And one very strong solar flare could send us technologically back to the 1950's. The losses would be in the quadrillions of dollars and millions of lives. Much of what we would be required to do to survive is no longer within our narrowing skill set. It was estimated some time ago in Australia that 80% of the jobs available when graduates enter the job market did not exist at the time of their birth. While this may seem absurd, when I was born, there were no jobs as computer programmers, accounting was done on adding machines, vast hordes of typists were part of every American corporation, and cars were assembled by men standing in line with wrenches. We seem to be balanced on a crux. Behind us on the time line is half a billion years in the development of man, and less than 100 in which the greatest portion of humanity has been advanced much further than the stone age in comparison. Is this a precarious edge? And so a reasonable question for those with educational concerns, and concerns for our own children is, "How can we prepare them for a future we cannot foresee?" I wave a win/win solution that applies whether we go on in our rapid state of technological advancement or if for circumstances beyond our control, things were to fall apart, thrusting us technologically back into the 1950s or before. Teach children their own hands-on creative capacities. Insist upon the development of their skills of all kinds. Even if we were to go on with all our high-tech devices, working with our own hands creating beautiful and useful objects provides a foundation for all else. Being in touch with human culture and the tools through which human culture arose in the first place, has no downside. In fact, it might provide a vector sense of where we are going next, how to get there and how to make meaningful lives as craftsmen and makers of beautiful things. Yesterday, the first, second and third grade students were very pleased to have a free (creative) day. One decided she would make a baseball bat and discovered it was harder than she expected. So she shifted gears and made a vampire, too. It was a board with nails, so we had to use our imaginations. Another made tops (always a good fallback position when not feeling all that creative.) Still another made a civil war game and another a play place for her dolls. Children need time in school and out of school to engage their real world creative inclinations. And there is no better way to prepare them for the future, whatever that future might be than wood shop. My 7th, 8th and 9th grade students finished their outdoor 5 board benches, and so now they are in use. They are hoping to resume work on the lathe as their next project. While some schools are cutting back on recess to make more time for test prep, and core curriculum, the smart folks in neuroscience say all that's going in the wrong direction. The physical body (including the hands) are not separate from the brain, but instead are inseparably bound in development through action. The connections in the brain grow in response to what we do, not what we know. This article on "skipping to school" tells the same story I've told so many other times in the blog, except that it makes better reference to experts. At Clear Spring School, success in reading seems to go hand-in-hand with success on the monkey bars, and my mother, as a kindergarten teacher was trained to recognize the ability to skip as an indicator of reading readiness. There is certainly time as a child grows and develops to engage them in making beautiful and useful things, and then by starting the reading when they are more ready, no time will go to waste and children will learn to love reading. Want to know what I do when turned loose in my wood shop? I am working on boxes. In fact, if you look at he photo above, you can see a couple in process. To the box at left, I've added a drawer, taking advantage of the overall depth of the box to make it more useful for storing a small collection of things. At my desk, I am organizing photos, and working on a chapter of my hands-on learning book to hand off to an agent. I also visited with a local luthier to work out minor problems I was having with the tuning of my box guitar. We made great progress and I learned to not glue the bridge in place, as it is nice to be able to move it around for best tuning. I spent Tuesday afternoon with Michael Dowd and Connie Barlow, writers about science, evolution, and religion. According to Michael's view religion and the invention of God were man's attempt to come to an understanding of reality. Now science is fulfilling that position, and perhaps a better term for God would be reality, or universe. However, it seems that folks want to believe that God is personal, cares for them, agrees with them and gives less than two hoots for anyone else. I guess that kind of thinking preserves a sense of specialness and superiority. I am reminded of the Zen story where the man's wife had died and he asked the Buddhist priest to recite the sutras in her behalf. But he said, "before I pay you any money, I want to make certain that you guarantee that my wife's spirit receives the benefit of your prayer." "All sentient beings benefit when the sutras are recited," The priest replied. "Well can't you read them so that woman across the street that my wife hated so, doesn't receive benefit?" The man asked. And so, we human beings tend to be a narrow minded lot, selfish in our perceptions, unwilling to surrender our own comfort of body and belief for the survival of species that are threatened on all sides of us. I was attempting to explain to Michael and a bit to Connie (we were on a walk on a narrow trail and conversation with two folks at the same time was impossible) that the hands are essential to our understanding of reality, and they shape not only our intellect and understanding, but also our character as we learn and develop under the inspiration of craftsmanship. Those who live with a passion that requires growth tend to be the most moral of human kind, whether their passion involves making beautiful and useful things, or something more temporal like the making of music. Our planet is suffering. We've discovered that we have an abundance of oil, and fossil fuels enough to destroy the planet and at least half of our kind are giddy about the prospects of that. And so, how do we bring things into bounds? When we live out of touch, meaning that the hands are no longer creatively engaged, we put everything at risk, and all on the line. When I was in college we celebrated the very first Earth Day, and as an innocent, I presumed that my own generation would amount to something more than rampant consumerism. And yet, by the time I became a craftsman in the 70's I saw that we were losing touch. Corporations seem to rule nearly all. Schools now are places where children are kept from the experiences and exercises that would help them arrive at creative and responsible lives. Even science is held at arm's length, to be gotten from books and not from engagement in reality. "We engage the world and its wonders, sensing and creating primarily through the agency of our hands. We abandon our children to education in boredom and intellectual escapism when we fail to engage their hands in learning and making." Today at the Clear Spring School, Michael Dowd and Connie Barlow will meet with the high school class. I will have free day with my first, second and third grade students. This afternoon, my 7th, 8th and 9th grade students will finish making benches and begin helping me make new knives for wood shop. I am rapidly arriving at the conclusion that while there may be nothing absolutely special about the golden rectangle, there is something special about the rectangle in general in that it's not square. The aspect ratio of rugs and photos and paper sizes may only be for convenience and for effective marketing but there is purpose in making things rectangular rather than square. 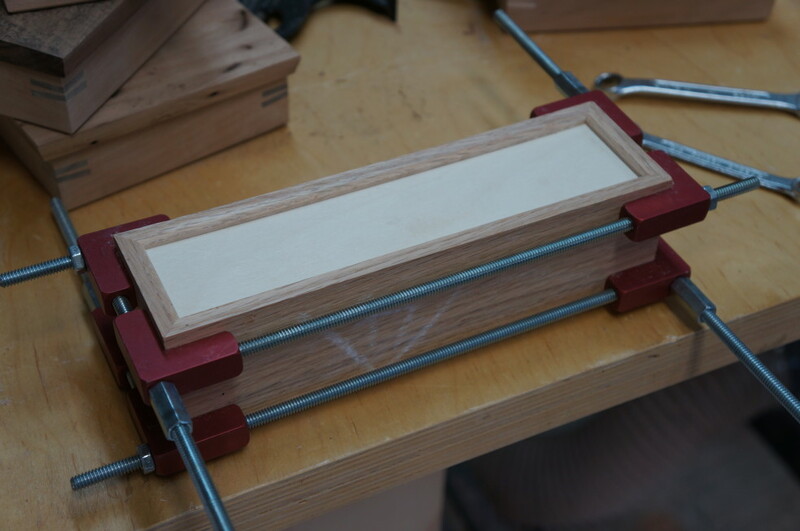 For a box, being rectangular means that one long side gets hinged, and because that long side is long (not short), the lid is more stable and the hinges have greater strength. It would also be awkward visually and to the touch if the box hinges were located on the short side. (believe me, I tried it). In any case, it seems that until my reference librarian tells me otherwise, I'm assuming that my ratio of x:x +/- 2 is an ideal formula for making a box if you have no idea what you might be planning to put inside. I have sort of followed this formula for years. For instance, one of my production boxes is sized 3" x 5". 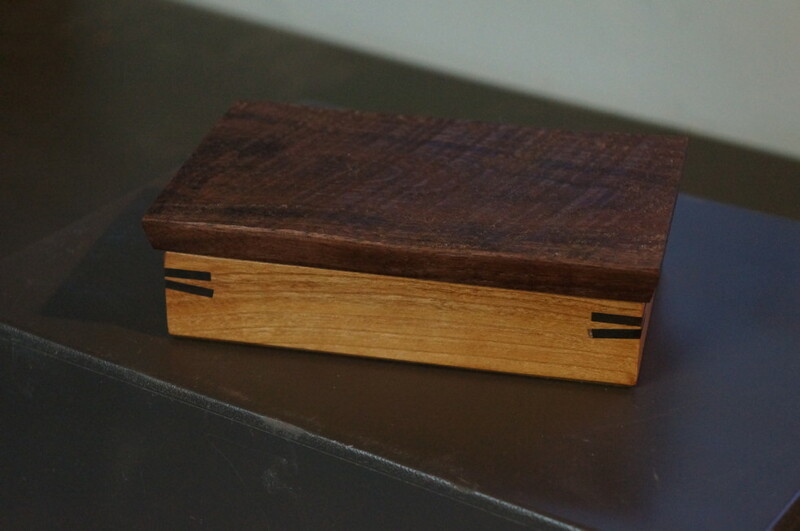 A hand-cut dovetailed walnut jewelry box that I made for my mother in about 1980 was sized 8" x 10". So is there any more magic in this formula than in the golden rectangle made popular by the ancient Greeks? I don't propose that. And if any formula takes you to the wood shop and gets you busy developing skill and trying to prove something to yourself, we all win. It seems that as we've become more sedentary, we've become less intelligent as well. Researchers have noticed the close relationship between development of the body and development of the brain. That may be partly why Finland Schools are tops in the International PISA tests, far surpassing American schools in reading, science and math. Finland as a nation is committed to physical education. They devote more hours to PE and recess than any other nation in Europe. And their test scores tell that story. We, on the other hand, try to take a more direct approach, force feeding reading and math whether kids are ready or interested or not. Then we test them with obsession to see if anything that we hurled at them stuck. There is a well established link between the monkey bars (brachiation) and the child's readiness to read. Another classic technique to determine reading readiness was for the teacher to observe whether or not a child could skip. The intraparietal sulcus is the part of the brain that controls both the movement and sensing of fingers, and also the ability to count and perform math. So you might observe that the education o the mind is best arranged through the actions of the body. I think most of us can understand the importance of children making beautiful and useful objects and performing instrumental music and having the hands engaged in doing real things. That which we learn hands on is learned to greatest lasting effect. At some point researchers will turn greater attention to the hands and discover that the brain became what it is because we have hands, and that the use of the hands is required for the full growth and development of each child. In American schools, as we impose stillness on the hands we retard the development of intellect. I am still pursuing the origins of the x: x+/- 2 design principle which I mentioned in a late afternoon post. Besides common photo sizes, the rule applies to other things, like rooms, and rugs (check sizes). Again, common rectangular sizes whether inches or feet are 5 x 7, 6 x 8, 7 x 9 and 8 x 10. In room sizes the formula jumps up to 10' x 12', 12' x 14', 14' x 16' and each can still be expressed as formula x +/- 2. Is there some magic in +/- 2? While I doubt that the various rectilinear shapes developed by the formula actually present greater beauty than other shapes, there seems to be convenience in it, and perhaps comfort in its non-squareness. 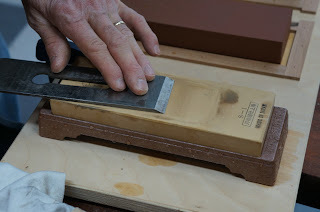 And if a simple formula makes box making choices easier to make, leading to more beautiful boxes being made by craftsmen, and more fun being had, use it and see what you get. The tea boxes shown in the photos above are 7 3/4 in. x 9 3/4 in., as fine a proportion as any and again adhere to the design rule x:x +/- 2. To show how little human beings have changed in the last 50 years, pay attention to sugar, fat and salt... three important parts of nutrition that were once scarce (hence the constant cravings) and now may be the death of us, unless we act forcefully against our own innermost inclinations.